Mezza (pronounced meh-zah, which means “small plates” in Arabic), reflects the Syrian custom of sharing a table covered with a variety of dishes. In homage to that mentality, the vast, eclectic menu at the grille may be confusing until diners understand the meaning behind each dish. When Mike moved to the United States from Aleppo, Syria in 1989, he brought a love of food inspired by traditions of his homeland. After absorbing many influences in the United States, he opened a restaurant that reflected his favorite dishes—tweaked to include a variety of global influences. If you can get past the addictive complimentary appetizer of crispy pita, the menu offers something for just about everyone. But first, that pita: Mezza Grille sources the bread from Phoenicia Specialty Foods, then a cook splits it in half, bastes with butter and adds a generous sprinkling of fresh Parmesan cheese, fresh garlic, black pepper, salt, rosemary and other spices. Then, the pita is baked until super-crisp. It is served as chips with tiny bowls of olive oil and za’atar seasoning. Dip the chip in the oil and then again into the za’atar and for a wave of flavor. Entrees include bacon-wrapped filet mignon and New Zealand lamb chops plus spicy seafood risotto, three kinds of skewers (shish kabob, shish tawook, and kufta kabob) and chipotle beef tenderloin pasta. The signature Mango-Stuffed Chicken is essential. 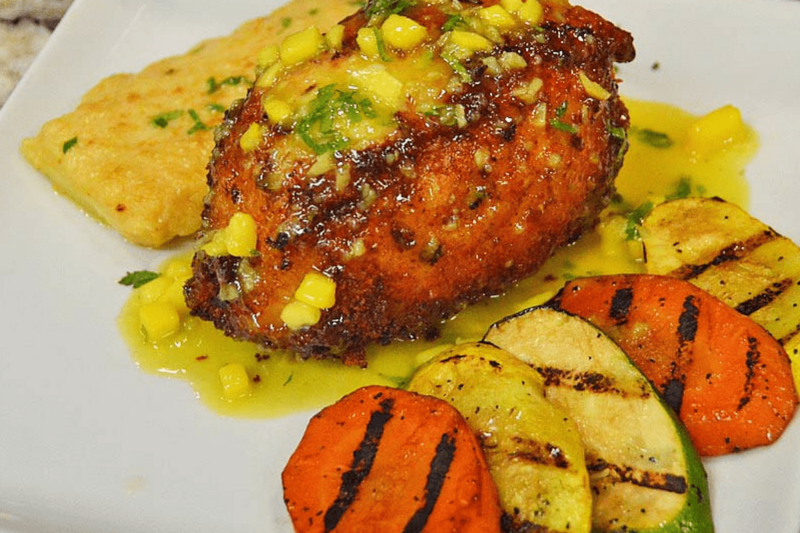 It features thin, pounded chicken breast stuffed with a flavorful mixture of breadcrumbs, vegetables and herbs, rolled in more breadcrumbs, seared, baked and then topped with a rich, sweet mango butter sauce and chunks of fresh juicy mango. First-time guests should be aware that every dish is prepared to order using all fresh ingredients, which can mean a wait of 25 minutes, minimum, for entrees and 15 minutes for grilled items—especially during busy hours. 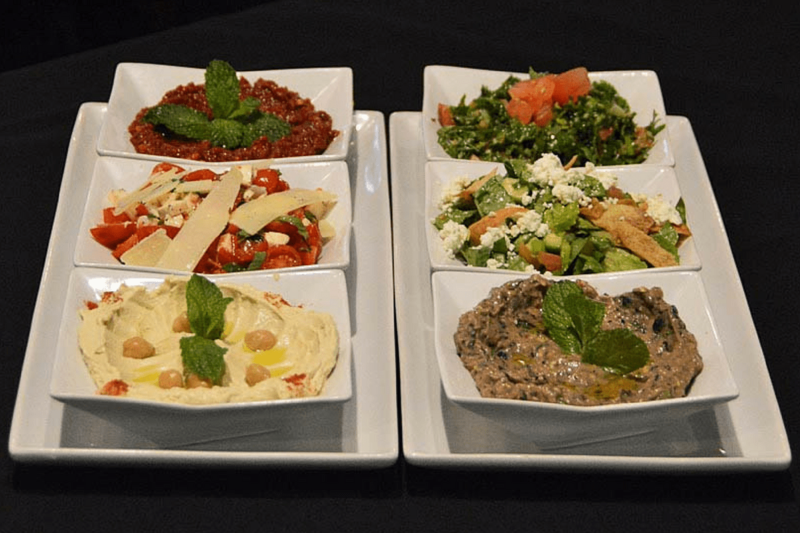 Use the extra time to order a starter like the Pick Six appetizer: generous portions of silky hummus, zesty sweet red pepper dip, earthy-garlicky eggplant dip, bright and citrusy tabbouleh, minty fatoosh salad with crispy pita chips and light bruschetta. The platter is enough to share with a table or ensure leftovers for a light meal the next day. The Almond-Crusted Baked Brie is another solid choice. It features a gooey wedge of Brie coated in almonds accompanied by juicy sliced strawberries, crunchy walnuts, a side of jalapeño pepper jelly and ovals of toasty baguette. The 50 options on the judiciously curated wine represent both New and Old world varietals. Pricing is very modest; glasses start at $10 and bottles are no more than $35. Stephanie recommends Storypoint Cabernet and Chardonnay and Freakshow Cabernet from Michael David Winery. The bar also offers selections from local and national breweries along with cocktails ranging from a traditional Manhattan to a crisp and spicy Cucumber Jalapeño Margarita. The spacious interior manages to remain intimate with black tablecloths and an assortment of artworks from local artists, including some from the owners’ daughter Nijah Tibi who also works at the restaurant. Three years ago, the restaurant expanded to include a lounge ideal for happy hour or date nights. 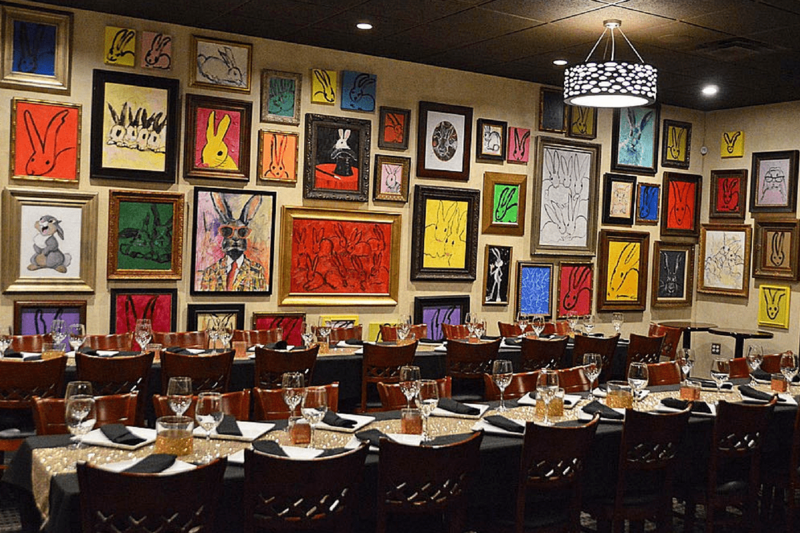 Reserve the whimsical “Bunny Room” for parties up to 100 guests, in which the walls are covered in hundreds of artistic expressions of nature’s favorite cottontail. Mezza Grille, 6100 Westheimer, 713-334-2000, www.mezzagrillehouston.com, open Sunday through Thursdays 11 a.m. to 10 p.m. and Fridays and Saturdays 11 a.m. to 11 p.m.